The majority of flies that occur indoors are harmless and present only sanitary concerns for homeowners. But 'biting flies' such as mosquitoes, deer flies and horse flies can deliver painful and potentially dangerous bites. Therefore if you identify a horse fly population in your home, it is always best to act to remove it at once. Horse flies can deliver painful bites. Horse flies tend to be the same size as common house flies or larger but the appearance of their antennae makes them easily distinguishable. Horse flies all have three antennal segments, two jutting out on either side and a much larger and more visible segment between the other two. 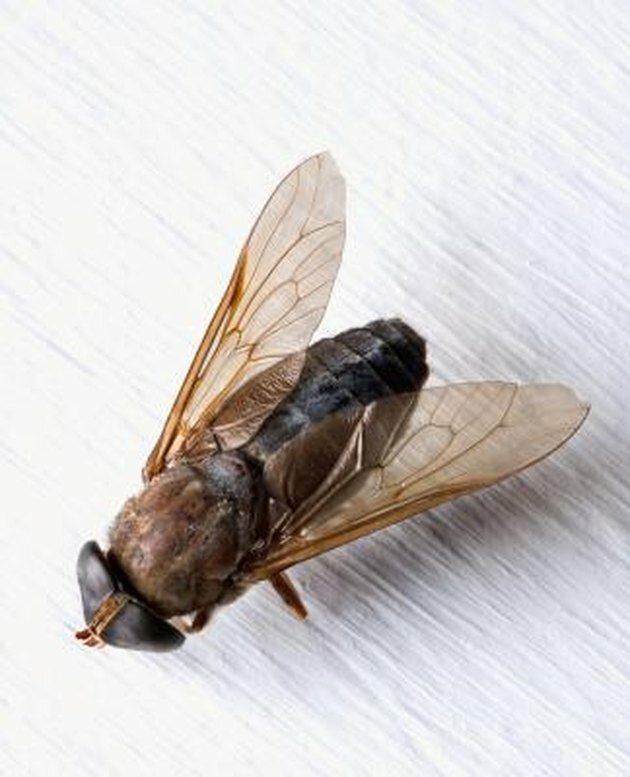 Horse flies also always have brown, gray, or black bodies and dark colored wings. As is the case with most other types of insect infestations, preventative measures are your first lines of defense against horse flies in the home. Good sanitation and house-cleaning practices can stave off a horse fly infestation since their larvae tend to develop within decaying organic matter. Installing screen on doorways and windows can also prevent horse flies from coming indoors and taking up residence in your home. If you have already discovered a horse fly infestation in your home, however, preventative measures will be of a little use.Natural control methods for horse fly infestations include fly paper and fans. Horse flies are bothered by smoke, so burning candles can also impel horse flies to leave a home in which they have taken up residence. However, these measures show at best marginal effectiveness at removing a horse fly infestation. Pesticide applications can also be moderately successful at controlling horse fly populations. Fog and "space spray" pesticide applications can kill horse flies on contact but populations often quickly return to the same treated area. An alternative method is to use pesticides containing Bacillus thuringiensis or methoprene that are designed to kill horse fly larvae. The key to success, however, is finding the larvae of the horse fly, often made difficult by the horse flies' proclivity to breed in secluded areas.